Spring fever has officially hit D’Artagnan! We love everything about this time of year – longer days, warmer temps, birds singing, trees budding. But what really excites us about spring? The seasonal bounty that flows into the Mushroom Department this time of year. First in? RAMPS! The ramp is a wild onion native to North America, and is sometimes called spring onion, wild leek or wild garlic.According to John Mariani, author of “The Encyclopedia of American Food and Drink,” the word ramp comes from “rams,” or “ramson,” from Elizabethan dialect, referring to wild garlic. The word is first mentioned in English print in 1530, and was used by English immigrants of the southern Appalachian Mountains, where ramps grow in abundance. In fact, West Virginia celebrates the spring season with ramp festivals and events. The ramp resembles a scallion with a pungent bulb below ground, but could be mistaken for a lily-of-the-valley above ground, with dark green, broad leaves, that grow about six inches tall. The lower part of the stem, near the white bulb can be tinted with a reddish-purple color. You cannot mistake the ramp for anything else in the bare forest. Just break a leaf and if you smell the very garlicky-onion scent, you’ve found yourself some ramps. 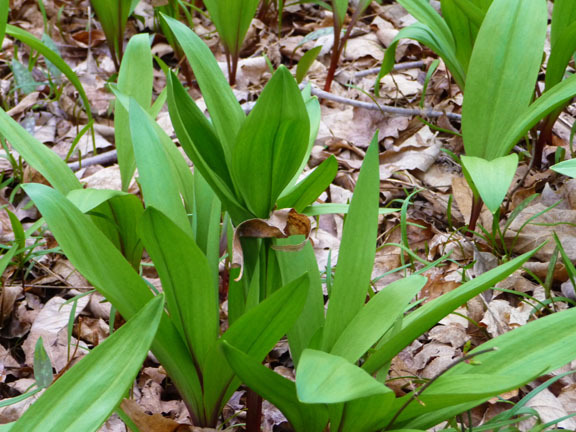 Ramps grow from South Carolina to Canada and are often the very first green thing to appear in the dun-colored, winter-weary forest. 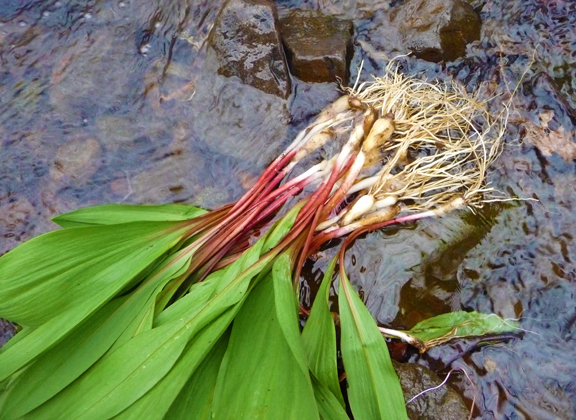 Ramps are most often found near the banks of streams or rivers, in moist areas that are shaded, and on hillsides. They grow in clumps and spread outward, so are often spotted in large patches of green leaves. Ramps are an easy and safe plant for the beginner forager to pick and eat. Long appreciated by country folk and eaten as a spring tonic, the ramp has in recent years taken on a mantle of cult status among chefs in fine restaurants. As a result, there are more people enjoying ramps than ever before. Ramps have defied attempts at cultivation, so are only picked in the wild. There are concerns that ramps may be overharvested. While that might not be a realistic concern about this tough little forest plant, ramps do take several years to propagate. 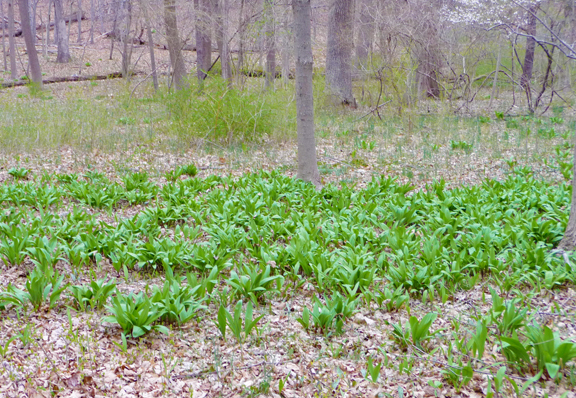 So if you do forage for ramps, pick only what you need and know you can eat. Don’t pick all in the same spot, but try to thin out areas that are packed with plants, leaving room for the remaining plants to spread, and provide you with more ramps in seasons to come. A good rule of thumb is to never take more than a third of a patch. Since ramps are collected in the forest, they tend to be dirty. The bulb and roots are always coated in dirt, so they must be heavily rinsed. Cut off the roots as close to the bulb as possible, and run the green leaves under water carefully. Bugs, twigs, pine needles and other detritus of the forest floor might hitch a ride on your ramps. The leaves and bulbs are both edible, though are often cooked separately, as the bulbs take a bit more time to cook through. The bulbs offer a punch of garlic flavor to any dish that might benefit from that: soups, eggs, rice or potato dishes. Ramps can be eaten raw, as you would a scallion, though they will be much stronger in flavor. In central Appalachia, ramps are most often fried with potatoes in bacon fat (though duck fat does nicely, too), or with scrambled eggs and bacon. Like their onion cousins, ramps get on well with bacon. Perhaps it is because of the way that the smoky intensity of bacon balances the pungent garlicky essence of the ramp. Whether you sauté ramps as you would onions, or grill them whole, add them to a casserole or gratin or mix them into a cornbread stuffing, the only time to eat them is in early spring. Unless you pickle the bulbs to enjoy as a garnish the rest of the year, or freeze them for winter cooking adventures. Some people are content to simply enjoy ramps during those early weeks of spring, when they are the first green vegetable to appear after a long cold winter. Next Post IACP Post-Awards Party Recap!